Just when 20th Century Fox seemed to be back on track with the humongous hit that was Deadpool, they take a sizable step back to mediocrity with the staggeringly paint-by-numbers affair that is X-Men: Apocalypse. It’s unthinkable that such an outstanding ensemble cast, including some of the most talented young actors around, should be pinned down with such clunky dialogue and middling special effects work. Throw in some scatterbrained storytelling with a world-class bore of a supervillain and you have a recipe for one of the more forgettable entries in the X-Men franchise (and yes, I include the Wolverine movies in that list). In a Gods Of Egypt-esque opening, we are introduced to the all-powerful mutant Apocalypse (Oscar Isaac) as he is buried under an Egyptian pyramid thousands of years ago. After magical sunlight awakens him in 1983, he finds himself distraught with the current world order and seeks four mutants, including Magneto (Michael Fassbender), to help him regain the proper balance for a mutant hierarchy. It’s up to the X-Men team, led by Professor X (James McAvoy) and Mystique (Jennifer Lawrence), to save humanity as we know it and stop Apocalypse and his Four Horsemen from global decimation. With a plot this rote, a compelling antagonist could have potentially salvaged things but even a great actor like Isaac just can’t bring any personality or liveliness to his monotonous character. Buried under modulated vocals and layers of makeup, he doesn’t get much of a fair shot to weave any kind of nuances into his performance and instead draws from the same bank of indignation and sullenness with each line reading. His character’s plan and overall motivation is murky throughout and despite his ability to do just about anything, he is oddly much less threatening than other villains that are comparatively more limited. Elsewhere, it seems another paradox has developed wherein the more characters are introduced in the X-Men series, the more they all tend to become indistinguishable from one another. Outside of their varied superpowers, each mutant seems to be trending toward one unified emotional state of angst and brooding, even though there isn’t an especially good reason for that to be the case. It’s plausible that it’s the effect of similarly glum YA adaptions like the Hunger Games series, which wouldn’t be a stretch since Jennifer Lawrence’s Mystique is basically Katniss Everdeen in a different outfit when she gives a would-be empowering speech at this film’s conclusion. It’s disappointing that director Bryan Singer, who led up three previous X-Men successes, just can’t seem to find the flavor and uniqueness to each of these characters beyond their main superpowers this time around. Some characters like Nightcrawler and Quicksilver (who has another humorous slow-motion scene that recalls the Days of Future Past sequence) break the mold sporadically but don’t get enough room to breathe with all of the existing clutter. 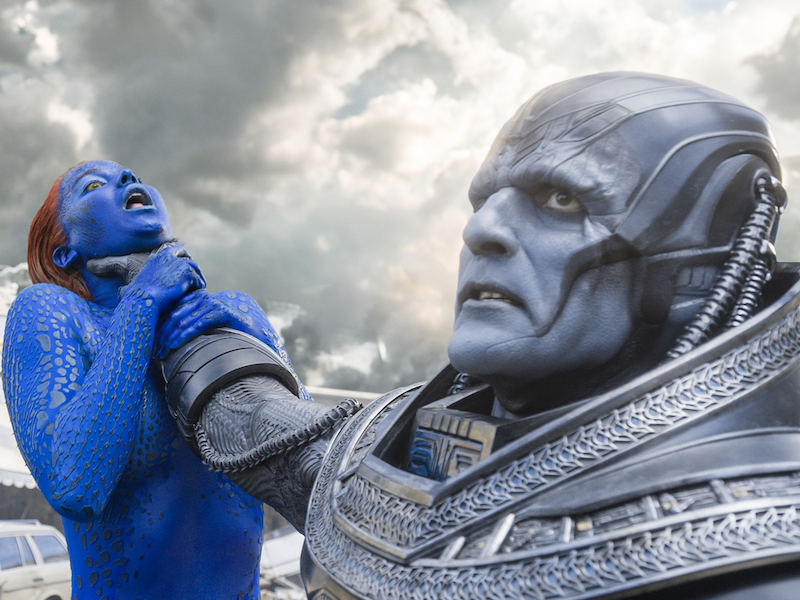 X-Men: Apocalypse just has too many objects up in the air and unlike one of its hypothetical mutants, not enough arms to juggle them all successfully.